1984 New York and Zürich: Peter Blum Edition. 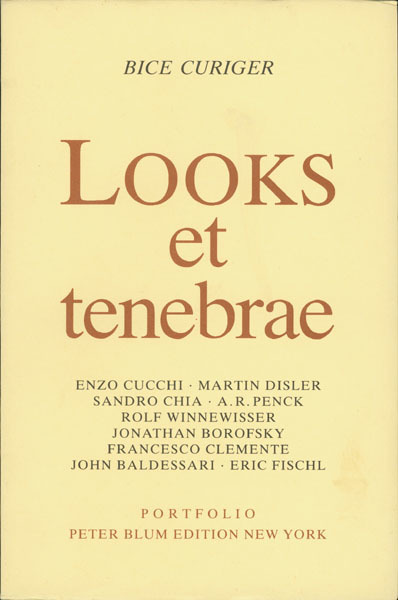 Monographs in German and English on the ten portfolios published by Peter Blum Edition between 1981 and 1984 with the following artists: Enzo Cucchi, Martin Disler, Sandro Chia, A.R. Penck, Rolf Winnewisser, Jonathan Borofsky, Francesco Clemente, John Baldessari and Eric Fischl. Each portfolio is printed in full in black and white reproductions. Bice Curiger’s short essays are accompanied in most cases with statements by the artists. Preface by Jean-Christophe Ammann; epilogue by Peter Blum. 294 pages, 116 black & white reproductions, 2 black & white foldout reproductions, softbound.